Self Forming Screws create their own thread inside the wall of the pilot hole. 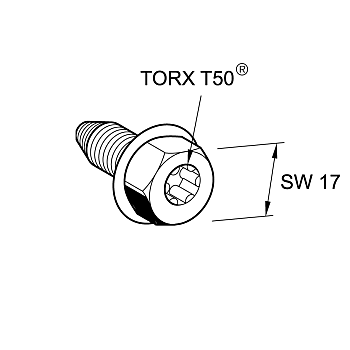 During the screw-driving operation with a T50 driver, the base steel is re-shaped and hardened to form an air-tight seal between the threads of the screw and the surrounding steel. This increases the overall strength of the fastening, making it extremely resistant to loosening caused by vibration. The Self Forming Screws are available in size M10 x 30 and have the same High Corrosion Protection finish as the Beam Sections and End Supports. Available in size M10 x 30. Our fast order processing, extensive product range and comprehensive stocks of key lines means we can usually guarantee next day delivery of your order. Where can I find your product updates or promotions? What are your cut off times to place orders for next day delivery? Have you tried using tamper resistant security screws? Our range of 6-lobe pin and sentinel screws are ideal for projects which require a cost effective method to prevent opportunistic vandalism or theft. With the emphasis for the installation of services being on reducing time and labour, the use of wire suspension kits is becoming increasingly popular. There are many types of screws and bolts available with multiple head types and finishes depending upon their application. Check out our handy guide. We can cut and combine common stock products such as Channel, Studding, Pipe Supports and Rubber Mounts to create bespoke prefabricated supports and brackets. © Fixmart Limited All rights reserved.